In search for fresh vegetables, slow instead of fast food and a colourful market amidst nice old buildings? Then this is the right place to visit! 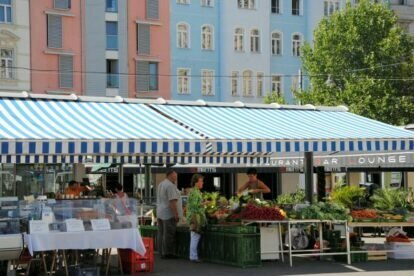 In comparison to the famous Naschmarkt (check the Naschmarkt article), the Karmelitermarkt is much smaller and has a less exotic variety of fruits and vegetables, but here you will find the local people of the second district go shopping. Especially on a sunny Saturday it’s very lively and after or before getting your bags filled, why not enjoy a coffee or a decent meal. Some of the small market stalls consist of just one or two rooms which function now as a restaurant. On a Saturday morning you can find a lot of food and herbs from organic farms of the nearby region on the Karmelitermarket but the earlier you come the better – though the official opening times are till afternoon. In the surrounding streets there are even more food stores or snack bars or nice small shops. The history of this very old market and the district itself is quite interesting: apart from the Nazi-time the Karmeliterquarter had always been a multi-ethnic place with a huge Jewish community. Nowadays you find shops for kosher food beside Turkish or Serbian stores and Italian restaurants.